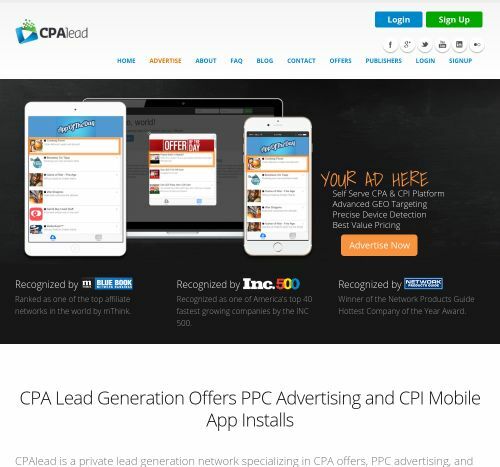 CPALead - Affiliate CPA network reviews and details. CPALead is a top web and mobile affiliate network with a wide range of geos and traffic offers. We provide CPA lead gen offers to Android & iOS mobile apps, content lockers, websites, and media buyers. We strive to monetize publishers’ websites and desktop traffic by using our banner, native ads, interstitial, pop-under, pop up, content locking, and other proprietary tools. At any given time, our network is developing over 5 new features for mobile app advertisers, PPC media buyers, website publishers, and content locking publishers simultaneously. We are willing to provide instant, useful support for new affiliates through our own forum and chat. Also, we attempt to keep up-to-date with publisher's continued feedback to making their requests come to success. Contact now if you need custom banners, post-backs, watch statistics in graphs for offers, lockers and countries, support csv upload. You can check CPALead reviews and Offers on Affbank and ask CPALead Team any question by using the contacts above, especially about how to earn money! Immediate activation of the account, nice!